The Return of Pizza Quest! AKA Ad Hoc 2 of 6! Wakka wakka! 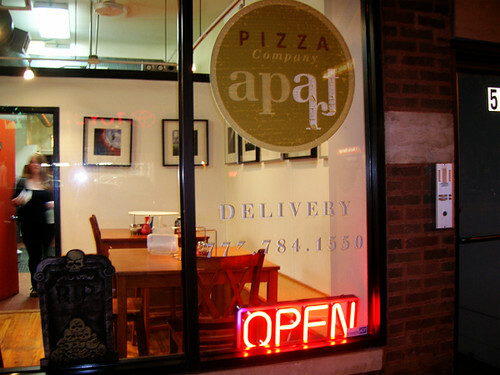 Apart Pizza Company is located at 2205 W. Montrose Ave. and 5624 N. Broadway Ave. Very good! Boy, the crust! I loved it, this was the most crackery crust that we've had so far. Not bready at all, wafer thin and crisp. We thought there could be a bit more cheese, it was really delicious; perhaps we are greedy. Good tomatoes, nice basil. Dawn has tried the above-mentioned Quattro Formaggi and didn't love the goat or the bleu, and I am not a fan of bleu. Do you know what the other two cheeses are, though? Brie and Parmesan, nom! Next time I'm going to ask if they will make a Due Formaggi, man, half brie and half parmesan. On that crust? Fuggedaboutit! 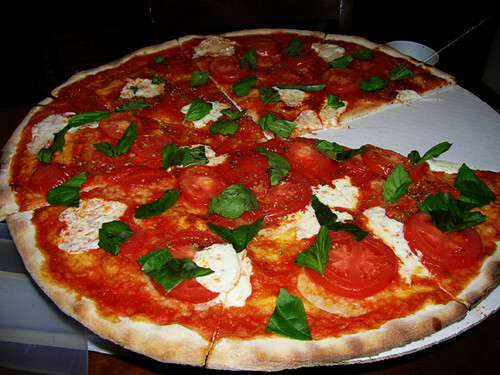 "Chicago-style is fine, but sometimes you don’t want to fall into a coma after eating half a slice of pizza." LOL, half a slice of pizza.